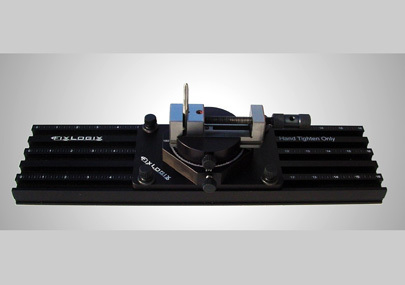 > The t-slot system offers multi-axis adjustment of part-locating components. > A 16.5" x 6" fixture base with (7) t-slots laser engraved with reference scales for easy repeat setups. A slimmer 5" plate with 5 t-slots is also available. Spring-loaded mounts for easy on/off the comparator. > (2) Laser-engraved 6" vertical risers with (6) t-slots. 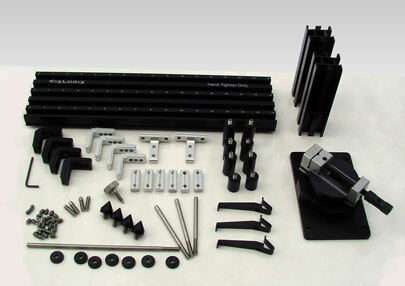 > New "near zero force" self-wedging clamps allow soft and fragile parts to be held with a minimum of distortion. > Sliding locators can be used in a variety of configurations to optimize part presentation to the comparator. > (2) Ridged right angle locators allow edges to be seen clearly with back-light illumination. > Integrated components like the jackstand, spherical fixture pins and conical locators may all be used on the plate, risers or standoffs for tremendous flexibility. > Kit components are anodized aluminum or stainless steel for corrosion free use. > Additional optional components like magnetic locators and swivel-heads are readily available.